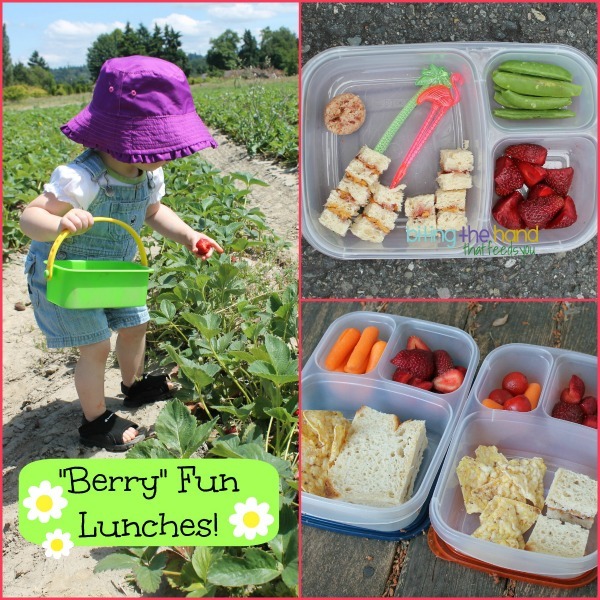 Biting The Hand That Feeds You: "Berry" Fun and Easy Lunches! 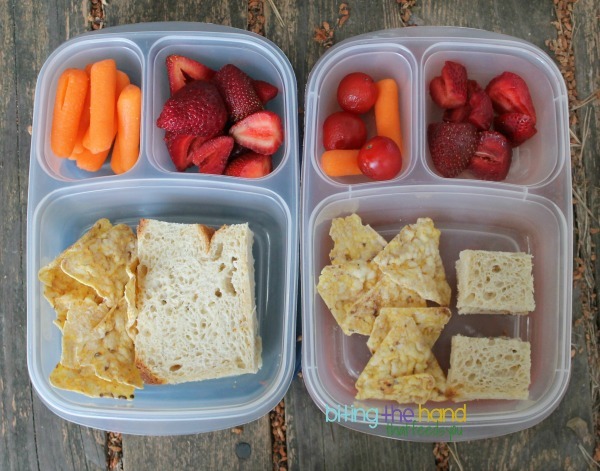 "Berry" Fun and Easy Lunches! Right after school ended, the local strawberry season started! We managed to make it to a u-pick farm before it was over. The girls love picking (and eating!) 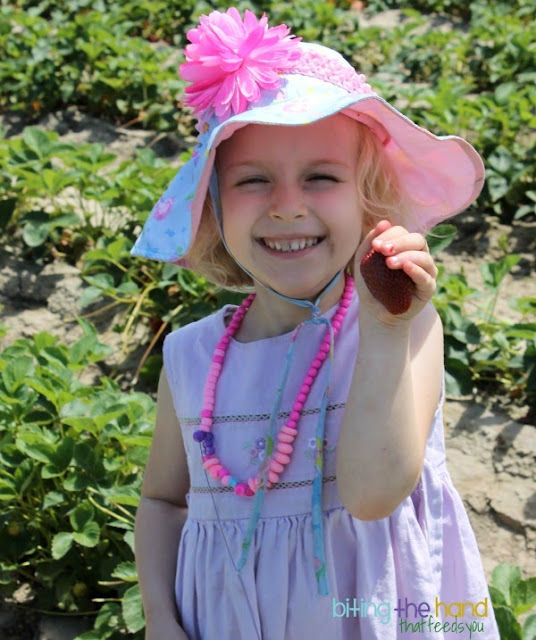 berries, and this farm uses organic farming methods, so you can eat right off the plants! (They don't pay for the organic certification though.) And unlike the raspberry nazis out by my sister, they allow you to eat as you go! 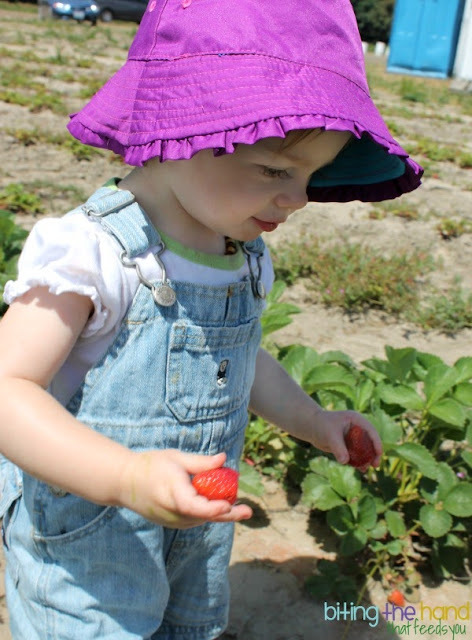 This was E's first ever harvesting adventure, as she'd been too little the year before, and rode in a carrier on my back. (Not too little to sample the goods though!) She had a marvelous time picking green berries and over-ripe berries, and whatever other random things she felt like adding to her bucket. She did manage to get some good ones, but soon wised up and started ransacking Mama's bucket! Tuesday, 6/18/13 - School was out for the Summer, and our schedule was already all out of whack. So even though we were heading off to Z's dentist appointment in the afternoon, the girls would be hungry again after their late breakfast. So I threw these together quickly, and included some of our fresh-picked berries from the day before! 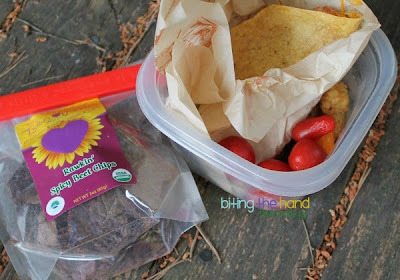 The day before, after doing all our berry-picking, I was tired, so I copped-out and got some Taco Time. Their corn tortillas (crispy tacos and chips) are gluten-free, as are the tater tots ("Mexi-Fries.") It's kind of my go-to lazy-day option, since I can sub beans to be meatless, and skip the cheese for dairy-free, so everyone has something safe to eat. Other than the tater tots, no one really loves it though. But no one hates it either! They have one of those magic Coke machines, with the fifty-three-gabillion different flavor options, so our drink options are limited. Since everything runs through some of the same tubes, and I don't trust that there isn't fake color or flavor residue in there. So basically, we can only order water (ice, and fill the cup in the bathroom, since their water comes out of the dye-tubes, same as the soda stuff,) milk (for Z - it doesn't make her sick,) or iced tea. Since Mama's not going to order anything that the kids can't steal sips from, no soda for me either! 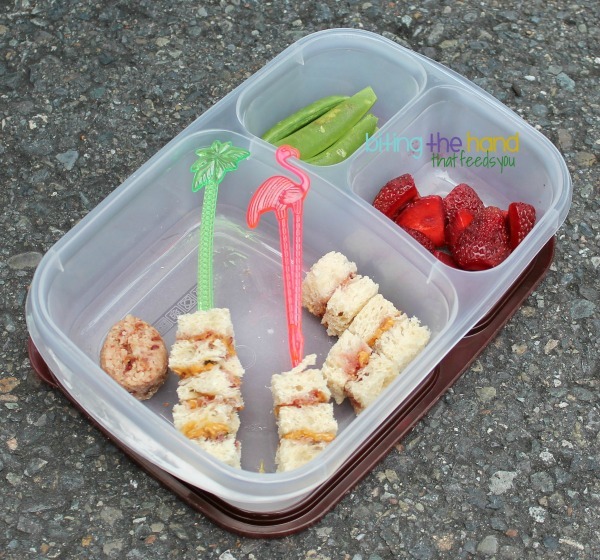 Friday, 6/21/13 - After Z's weekly occupational therapy appointment, we were heading to a local "Kids Day" fair, so I made sure to bring lunches to eat on the way! I'd made Z a frog-themed lunch (shared earlier,) so this is Baby E's. Basically the same as Big Sister's lunch, but without a real theme. Unless you count the tropical skewers. But I've done them already; they're old hat now. Although the Hail Merry strawberry macaroon was a big hit. Normally I'm stingy with those, and hide them from the girls. Especially the strawberry and salted caramel flavors (ooooooh sooooo goooood!) Baby loves them so much, she can recognize even the smallest sliver of the package, and starts demanding them! "Look Mama! Take a pichur! It's the biggest strawberry EVER!" So fun! Love the pictures of the girls! Adorable photos of your girls!